Kalanchoe tubiflora plants, also called Bryophyllum tubiflora, are tall, slim, attractive succulents that are easy to grow, according to information published by the University of Oklahoma. Native to Madagascar, these plants are often nicknamed the "chandelier plant" due to the way the clusters of orange or red, 1-inch blossoms hang down vertically from the top of the stem in an umbrella shape. These tropical beauties will only grow well in outdoors warm, humid climates, so they are often grown as houseplants. 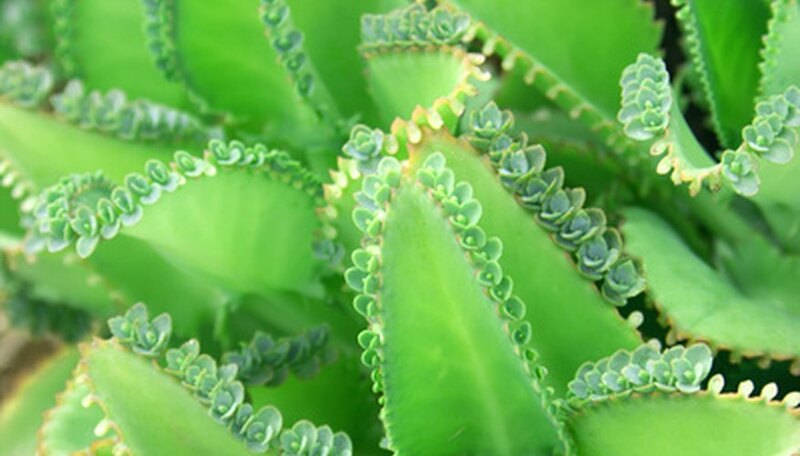 Kalanchoe plants are also easily propagated from the tiny plantlets that grow along their leaves. Plant or place your kalanchoe tubiflora where it will receive a full day's worth of sunlight. These succulents need bright light in order to survive, according to information published by the University of Oklahoma. Grow your chandelier plant in a soil mix that is well-draining. Potted succulents can be planted in a commercial mixture that contains a mixture of half sand and the other half peat moss combined with loam. Amend outdoor soil with coarse sand and peat moss to aid in drainage. Water only when the soil has dried out. Too much water can cause the roots of this plant to rot. Use a stick inserted into the soil to test for dampness, or simply stick your finger into the ground. Feed your kalanchoe tubiflora once a month during the growing season (spring through summer). Information published by the University of Oklahoma Botany Department suggests using a balanced (10-10-10) fertilizer on these plants. Note that the mother plant will die after blooming, but might sprout again from the roots the next spring or from plantlets that have dropped and taken root in the soil. This plant can grow quite tall--up to 3 feet--so you may need to tie it to a stake in order to support it.